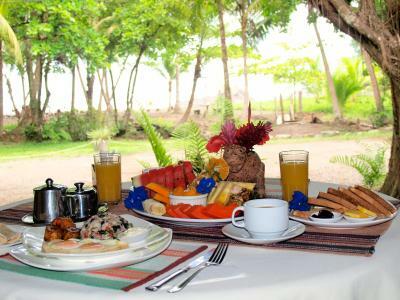 Breakfast was good, location is the only thing remarkable about this place, beachfront with an almost private, secluded beach and amazing scenery! Small but really clean swimming pool. The staff was helpful but perhaps not very enthusiastic. Rooms were clean. Beautiful calm beach just in front of the hotel. 15 min walk to Dominical. It’s position right in the most beautiful beach and 1 mile easy walk to Dominical. 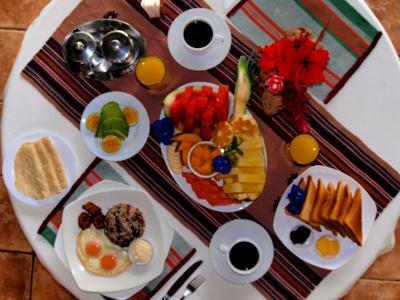 Best complimentary breakfast we had in Costa Rica! Awesome location, on the beach and walking distance to Dominical. Bar was cool with live music each night. The location with a small private beach is great. The owner Mike is super friendly and easygoing. Even there was no breakfast on Monday morning, Mike prepared some toast, jelly and very delicious cheese. Very nice ife music. La ubicación y la playa privada. Dominical no es un lugar tremendamente lindo y no lo recomendaría pero en el hotel estaba la mejor playa de la zona. La piscina buena. Habitación buena. Hotel Roca Verde Beachfront This rating is a reflection of how the property compares to the industry standard when it comes to price, facilities and services available. It's based on a self-evaluation by the property. Use this rating to help choose your stay! Boasting a fitness center, garden and free WiFi, Hotel Roca Verde Beachfront is located 0.6 mi from Domincal center, 4 mi from Alturas Wildlife Sanctuary and 6.8 mi from Nauyaca Waterfalls. With a terrace, the property also features a bar. Guests can enjoy a selection of American cuisine in the in-house restaurant. The hotel offers an outdoor pool and surf in surf out hotel. Guests at Hotel Roca Verde Beachfront will be able to enjoy activities in and around Dominical, like hiking. The nearest airport is Palmar Sur Airport, 39 mi from the property. When would you like to stay at Hotel Roca Verde Beachfront? House Rules Hotel Roca Verde Beachfront takes special requests – add in the next step! The property accepts Euros and Swiss Franc. Staff is rude, you have to pay cash which is ilegal in Costa Rica, right after you check in (at the bar/restaurant/front desk because there is no reception) a foreign gentleman let you know all the bad things about the place: breakfast starts at 8:30, NOT BEFORE as he repeats several times, and after that he explains that after 7:30 you shouldn´t show up for dinner either. There is no TV in the room, pillows are flat, beds umconfortable, table linens really dated and stained. We asked for our beach towels to be exchanged and it was not posible until the next day because the cleaning lady had left!!! At 2 pm!!! "Fitness center" is a small room with an old and rusted multifunctional machine, of course it is better to go for a run at the beach. We left a day earlier and the "staff" didn´t even ask why!!! (Of course no reimbursement). We have such a beautiful country with kind people, so please go somewhere else where you can appreciate the natural beauty of Dominical but also feel appreciated and welcome. As a family with small kids we felt more as a burden than guests. We travelled with children of 1 and 5 years who ran around as kids do. We left tables quite messy after eating and felt it was not appreachiated. Nice place, but I wouldn’t recommend it to families with loud or ”messy” kids. Another con was the road just behind the hotel. The room was extremely basic. The air conditioning did not work. There was no room safe. The WiFi did not work..at all....in either the room or on the balcony. The hotel backs onto the highway and one hears heavy transport trucks thundering past all day and night. The pool was so heavily chorined that it was unswimable. Our reservation was for three nights -cash only - which we had to pay at checkin. We left after one night and asked the manager by email if they would refund one of the two unused nights. The manager has not responded. A bit shabby looking, esp the frontage in arrival, and the decor in the room. Bit far from the city. Very quiet and nobody’s there at night. The room was filled with mosquitos. It was terrible. Rooms could use some updating...A little pricey. Restaurant is closed on Sundays, no breakfast on Monday mornings (see above). Staff and kitchen is very slow and unobserving while live music evenings with a full house. We waited very long for our pizzas. The hotel itself is good but really needs some renovations; e.g. some fresh paint and the bathroom some updates. I really would like to give this hotel a better rate but the value of money is a big issue; $145 a night is too much for what you get! And also when we arrived my name was not in their reservation system despite the booking confirmation I got.